The Vanishing Point filter is a very powerful feature in Photoshop CS3, especially once you know a couple tricks for drawing grids, and then placing and blending images to them. Awesome. Thanks so much for posting this one!!! I love the fact that you showcase the various fitlers of PS. Helps me get to know them and learn to love them. Appreciate it! cool! this is really helpful. Just a hobbyist, toying with PS, and this is going to be a nice timesaver. I love your tutorials, and this is one of my favorites. You’re a great teacher, and have great ideas! That was really cool! Never even looked at vanishing point before. I love using filters and now I have a new tool/toy to play with…thanks. I was having alot of trouble with this filter doing a homework assignment, but you have helped me out alot!! THANK YOU! Awesome! This is useful for a variety of other reasons, too. Thanks. thanks for the awesome tutorial. I love it. um…is it possible to go around curved lines…like sun glass….for example putting a picture on the lens….or is it easier another way? Just a thing I needed. Thanks! this is what Im talking about! ur great master corey! You have SAVED my grade with this tutorial!!. Thank You so much!! great tutorial. thanks..i always wondered what “hard light” was used for. I never found a use for it. Thanks for the tutorial Corey, another great one. I have used a picture of the theatre I perform in to add several images from my 365 day project of ‘Derek’s Beard’. This image is for the milestone of 100 days and I have four different vanishing points on it. Made easy with your help of course. I guess I am doing something wrong. When I copy and paste my picture and click on vanishing point, I get my grid, but my pasted picture will not move. Please help! Thank you Corey – a very useful tut! I thought I knew all about Vanish Point – that was until I viewed Corey’s superb tutorial! Thank you Corey. Thanks for the best tutorial I have found on using vanishing point. Mate, best tutorial I’ve seen on Vanishing Point. Thanks again, was a real help. I have same prob like Nikki Barks have, after making grid, when i insert pic into that grid, my ps cs4 get freezed, nd after 1 min it shows that close programme……. Thank you so much. You have helped me finish this project with this tuitorial! Thanks a lot! It was so usefull! hello Corey and thank you for your tutorials they are really helpful. i am trying today to do the same as you did but with text and i don’t seem to be getting it to work. can you make a tutorial if it’s possible for using vanishing point with text? Great tutorial. thanks. Youâ€™re a great teacher. The problem I’m having with this is…….how do you delete the grids to start over? Even if I close the image and open it back up, the OLD grid is still there! I have never thought vanishing point would be so power till I watch this video tutorial.Thank you so much Corey. This is a powerful feature in Photoshop, thanks for awesome tutorial. So glad you posted this. Great tut. I have a question, are there any differences in how it works in CS5? Seems mine doesn’t work quite the same with drawing new planes. I’m just learning this tool so perhaps it’s me. Love the tutorial. Would love to see another one using cs5. Making something fun with it. Corey Barker…the bomb! 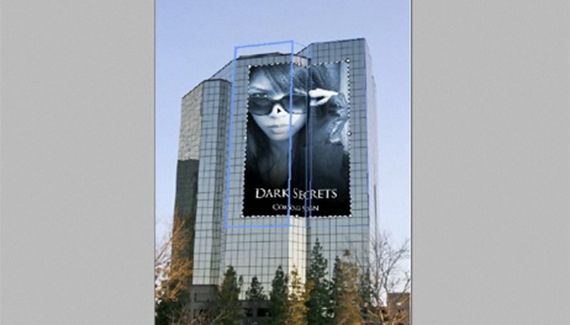 I have been trying to get this concept for weeks…I am taking a class in PS CS5…could not get it. Corey Barker, thank you, I understand you and your teaching style. Whallah! very nice tips, i just can’t understand the last part of removing colours where the poster look like the part of the building ? Excellent tutorial! Thank you so much! where is the f*king tutorial?